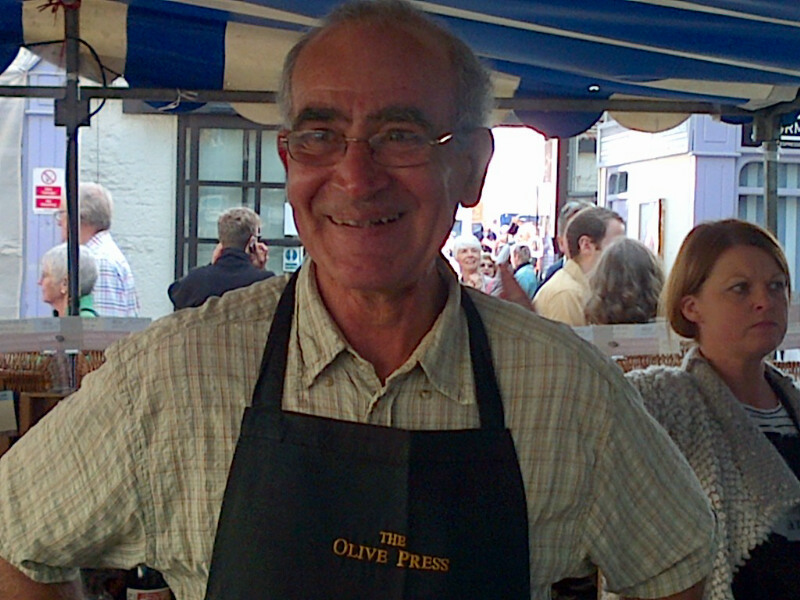 Olive seller Zenon Poyiadjo comes to Abergavenny from the wild country of Epirus, Greece, via his base in Ludlow. 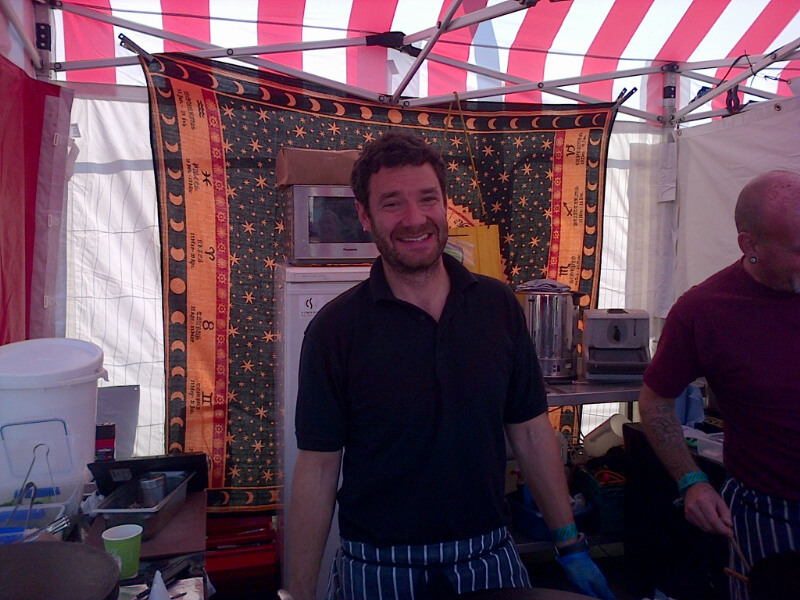 He is one of just three stallholders at this year’s Abergavenny Food Festival who were at the original event. “When I first arrived here, there were stalls for animals behind the Market Hall here,” The Olive Press owner says. Now, of course, the festival has grown into one of Britain’s biggest food events and has expanded into the Brewery Yard behind the hall, to the castle, Priory, the artisan kitchen school on Baker Street, Chadwick’s Place, Nevill Street and St John’s Square. It is hoped more than 30,000 people will attend this year. “The thing which has remained the same is the welcome. There was always a great welcome in Abergavenny, and I always felt it was a cultured place,” Mr Poyiadjo says. 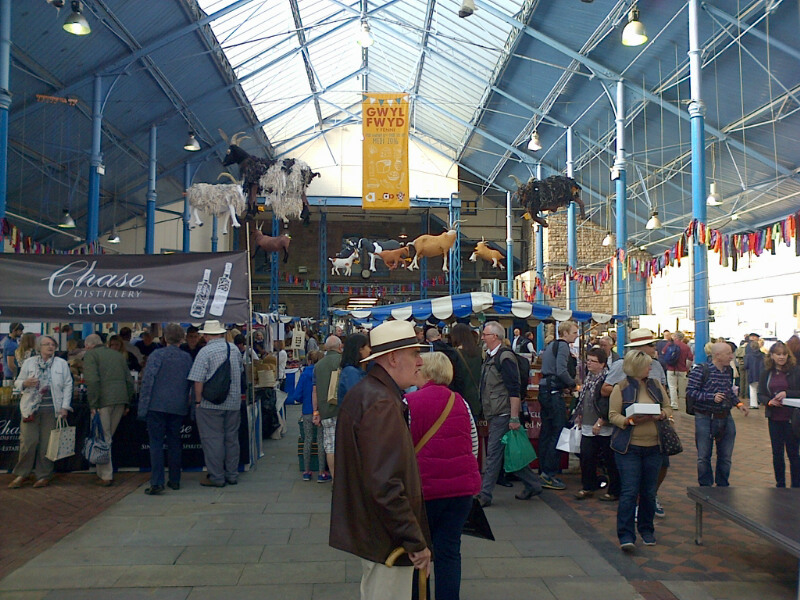 As visitors start to stream into the Market Hall, Duffy Sheardown of Duffy’s Chocolates is gearing up for his first Abergavenny Food Festival underneath this year’s art project, the giant goats dangling from the roof. He and his team have come from Cleethorpes, “We were attracted by the festival’s great reputation,” he says. The mixture of produce and styles has something for everyone, a great part of the festival’s attraction. 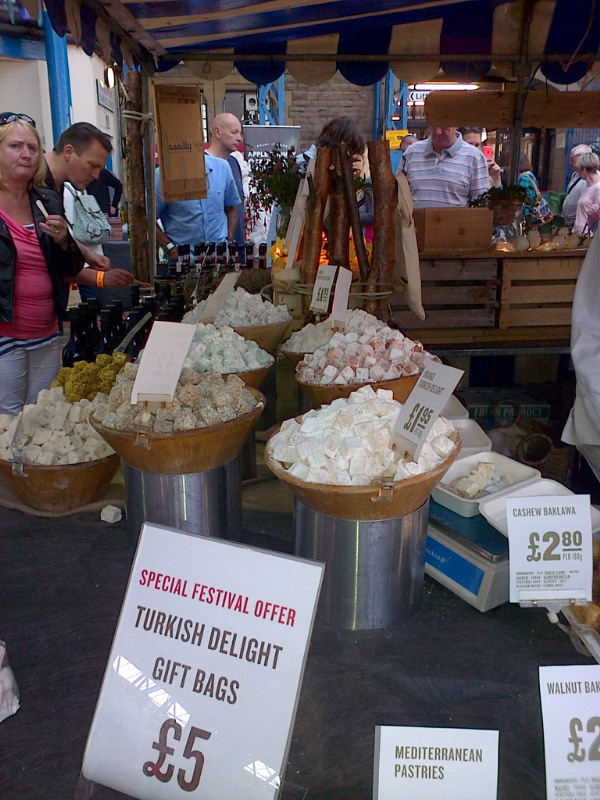 In the Market Hall, just one of the festival’s sites, you can find Welsh ice cream, Turkish delight and other Middle Eastern sweets from London-based Arabica Food and Spice, spirits from Herefordshire’s Chase Distillery, Coedcanlas honeys and marmalades from Pembrokeshire, and meats from the Black Mountains Smokery. Chef Simon King, of Restaurant 1861 near Abergavenny, is demonstrating how to cook with wasabi. Once he’s finished his slot, it’s back off to his restaurant for his lunchtime service. He does, however, have time to show us how to create a side salad for his fish dish with produce from his father-in-law’s garden. There’s oak leaf lettuce, beetroot leaves, chickweed shoots, marigolds and nasturtiums. A worker lets us smell black vinegar infused with seaweed as the chef completes his dish. Outside in the Brewery Yard, there’s biltong, cakes, pulled pork, and pancakes with a Welsh flavour at Crempog. Breton Loic Moinon, of Llantwit Major’s Crempog, has been coming to the festival for seven years. “It has just got bigger and better,” he says. 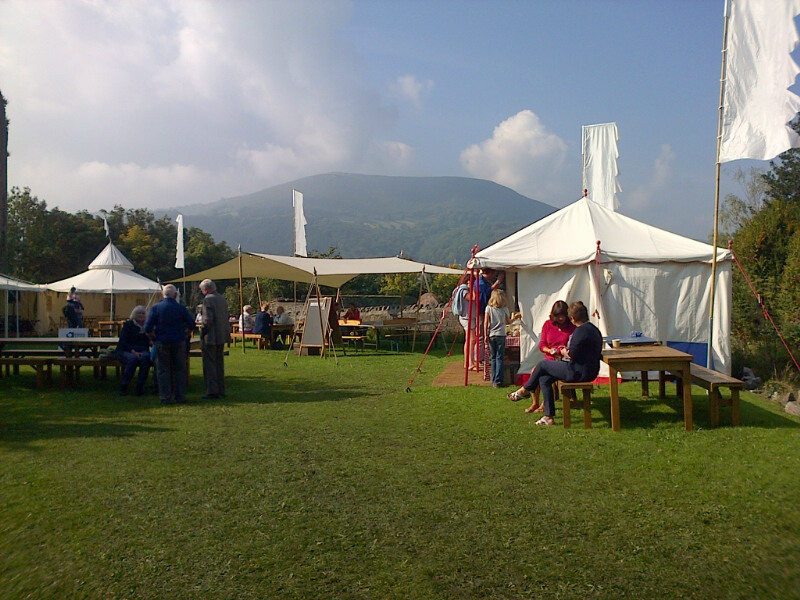 At Abergavenny Castle, there is entertainment from acts like Abergavenny Borough Band, and somewhere to relax with a real ale in the shadow of the Blorenge mountain. For local food businesses, food festival weekend in Abergavenny is an important part of the calendar. 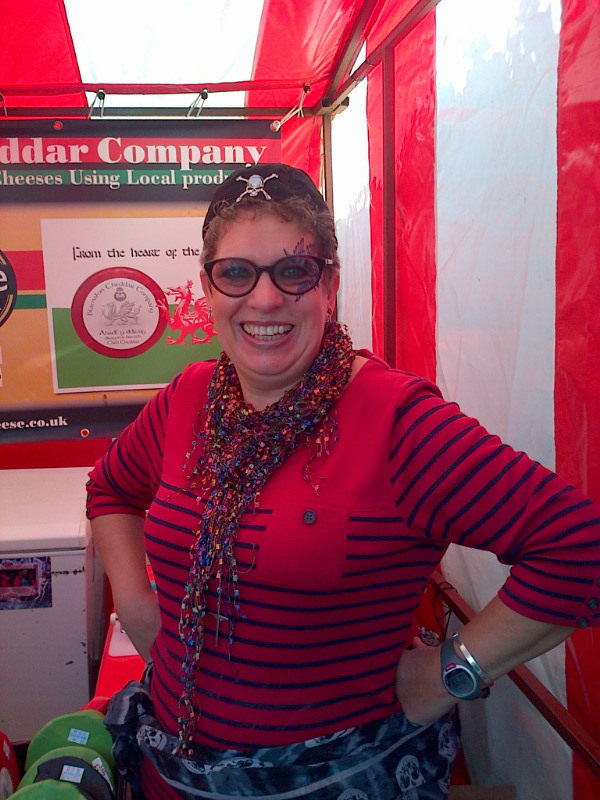 At Chadwick’s Place, where stallholders selling cheese, wine and spirits gather, Blaenafon Cheddar’s Susan Fiander-Woodhouse is dressed as a pirate – to celebrate Pirate’s Day. She has been coming to the festival for eight years. “It’s just got better and better,” she says. The firm matures some of its cheddar underground in Big Pit – something which in the past surprised visitors to the festival. “We had some very posh people who tasted it and said there was no way that could have been matured in a mine,” she says. Cwm Deri Vineyard from Martletwy, Pembrokeshire, is nearby – visitors are tasting its sloe gin, and buying its liqueurs and wines. At the Angel Hotel, festival chairwoman Melanie Doel introduces Cyrus Todiwala of Cafe Spice Namaste – which has a stall at Abergavenny Castle. The chef who has been coming to the Monmouthshire event for the past 13 years helped to officially open the festival’s Friday night events. He says: “Britain is all about great produce, and there is a concentration of that here.